Now that the "summer doldrums" for the metals and miners seem to be upon us – which may or may not last until after Labor Day – it might be worth your time to "measure" your precious metals' holdings. Let's start by taking a look at the terms and (simplified) definitions for foreign and domestically-listed mineral resource-sector companies that are listed on a Canadian stock exchange. It was the infamous Bre-X scandal, in which a Filipino geologist, Michael de Guzman, operating as a property project manager in Borneo, began "salting" ore samples with gold flecks shaved from his wedding ring. As word got out about the "big find," the price of the company, Bre-X Minerals Ltd. rose from $0.30 cents a share, to an eventual open market high of over $250! To keep the scam going, he bought panned gold from the locals, so that when examined, the new ore samples would show "color." Before long, some of the largest mining companies and investment houses in the business – and even the Indonesian government – were touting the story and trying to get a piece of the action. Independent auditors sent in to look at samples noted that the gold had rounded edges (which you might expect to find with stream-deposited placer gold), but Guzman simply made up excuses – which at first, everyone accepted. 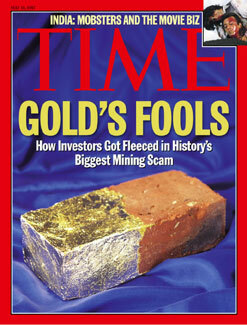 In late 1996, Lehman Brothers issued a "strong buy," calling it "the gold discovery of the century." From its start in 1994, until the bitter end a few years later, the share price rose, then fell like a meteorite, in what was to become perhaps the biggest mining scandal in history. After drilling twin holes alongside Bre-X's originals, mining giant Freeport McMoRan reported finding only small amounts of gold. On his way to meet with a Freeport due-diligence team, Guzman managed to "fall out of a helicopter 'to his death' from 600 feet," and Bre-X's share price collapsed. The final nail in the coffin was hammered when another report simply concluded that there was no gold at Busang. The uproar cost some investors their life savings and almost took down the Toronto Stock Exchange. The 5 NI-43 101 Categories: It is a formalized lifting – from most to least likely of being profitable – to define the economics of a precious (or base) metals' exploration/production property. Reserves – That part of the gold deposit that can be mined at a profit. Proven: It's 'highly-likely" this part of the deposit can be profitably mined. Probable: It's "more than likely" this portion can be mined profitably. Resources – This portion of the deposit can probably be mined at a profit. Measured: How much gold we think we have based upon mathematic and visual evidence. Indicated: Looking at geologic and projected evidence – this much more may exist. Inferred: Looking at all the data, this is how much gold we presume to exist. Very generally, a mineral "resource" is no more than a concentration of mineralization that has been defined by sampling and might be of economic interest [value]... a good friend of mine who does reserves for a living estimates that over a mine's life, 40 percent of all mines lose money, 50 percent basically trade dollars and 10 percent are bullet-proof to "mis"-management. Proven: The metal is in your hand! Probable: The metal is in a deposit box/hole in the ground. Measured: You have metal in an "allocated" or “segregated” ( stored and in your name only) account. Indicated: You have a "metals' entry" in an unallocated (mixed with others) account. Inferred: You have something spelled "m-e-t-a-l" in an Exchange Traded Fund (ETF). How to be sure that your metals are actually "proven reserves," not just some level of "resource"? Purchase from a well-established precious metals business. It helps if they will buy back from you at prevailing rates somewhere down the line. Choose a source that charges a fair markup over spot. Anyone offering to sell at a loss could sooner or later go under, perhaps taking your money or metals with them. Be certain the seller has determined to their (and ultimately your) satisfaction, that the metal you intend to purchase is "the real deal." If you decide to store with a dealer who offers a secure facility rather than taking delivery of your metal, be absolutely certain your holding is classified as "Allocated" or better yet “Segregated” (separated from) – not "Unallocated" (co-mingled) with that of other customers. Under normal market conditions, there is no excuse for a delivery delay once your funds have cleared. If you decide to "own gold" via an ETF, understand that these financial vehicles are usually not set up to allow you to request physical gold from them. Instead of actually holding metal that you might be able to someday redeem, you just have exposure (risk) to the metal's price itself. The course of the rest of this bull market? 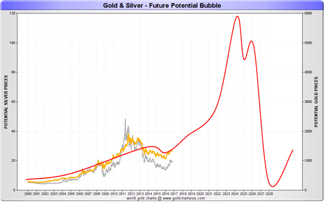 David Morgan, in his blog and at The Morgan Report, on many occasions has famously stated that metals markets (especially silver) "will either wear you out or scare you out." As investors ourselves, we understand your feeling and we "get it" that you may think gold and silver will flatline for all eternity. But we also do not believe this will be the case. In fact, we wrote the book, Second Chance specifically to argue just the opposite. Pick yourself up off the emotional mat, revisit your goals and financial planning, and hang in there. We're more than a little bit certain that the payday ahead of us as we exit this year – from what Doug Casey calls the "eye of the financial hurricane" – is going to be more than worth your wait. Here are a couple of quotes that may help keep you in the game. “The last time around, 10% of the global population participated. This time around, everybody is involved.” Mike Maloney, at the 8th International Banking Forum in Sochi, Russia.